Mental illness is a subject close to my heart, mostly because I suffer from it myself but also cause of the fact that so many people doesn't take it seriously. That's why I'm posting this picture, I feel that it's spot on and more people should see this, realize this. Mental illness is not a joke, living with it is hell for the most part, but there are good days too. I have struggled with anxiety, panic attacks and depression for more than 10 years and it isn't until recently they diagnosed me and I for the first time in my life got medication that helps me function while I learn how to handle it. My goal is not to be on medication for the rest of my life, I want to be able to live and be happy without, but it's a long way there and I need them as training wheels until I get there. 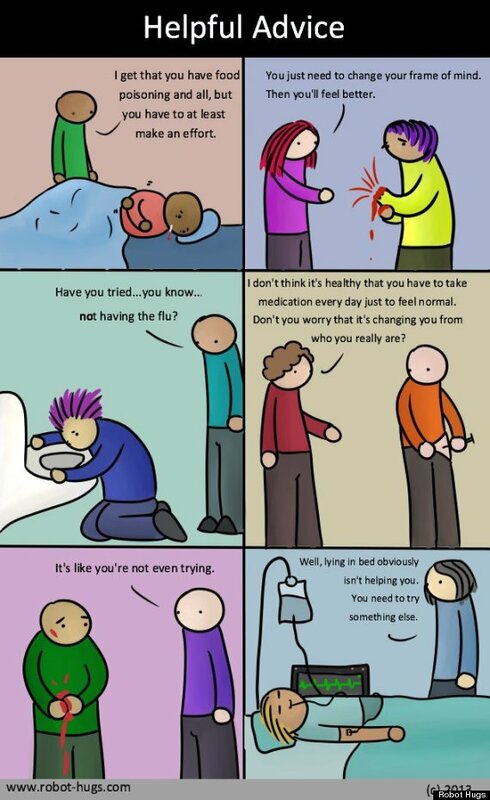 Just cause you can't always see or touch mental illness doesn't mean that it doesn't exist.